By fellow collector Z.Š. (Slovak Numismatic Society at Slovak Academy of Sciences) who is truly an expert when it comes to Czechoslovak passports and ID´s. However his main interests are Numismatics. Forming of Czechoslovak diplomatic service started already before proclamation of its independence on 28 October 1918. The Czechoslovak National Council created on 13 June 1918 in Prague was recognized already on 29 June, 8 August, 3 and 9 September and on 3 October by France, Great Britain, USA, Japan and Italy, while the Provisional Czechoslovak Government formed on 14 October in Paris was recognized on 16, 23 and 24 October 1918 by France, Great Britain and Italy, respectively. Its members, without any earlier experience in diplomacy, were confronted with necessity to establish contacts with other states and to lead negotiations with their representatives to anchor the international position of emerging Czechoslovakia. The first legacy was established on 26 October in Paris, two days before the independence declaration, the next two followed on 28 and 29 October in Vienna and Budapest. Absence of specialized diplomatic personnel was solved by engaging of lawyers, teachers, higher officials of various administrative bodies and later also demobilized Czechoslovak legionaries. It was also destiny of JUDr. František Havlíček. He was born on 5 April 1886 in Kiev in Russian Empire. In 1911 he graduated at the Faculty of Law of the Bohemian University in Prague, continued studies in Vienna and practiced at the Land Court in Prague. In 1916 he started to work in the Justice Department of the War Ministry in Vienna. Already on the day of independence declaration he entered in service of the newly established Office of the Czechoslovak Plenipotentiary in Vienna, as personal secretary of the plenipotentiary Vlastimil Tusar (a Moravian social democrat, since 1911 deputy of the Austrian Parliament in Vienna, since late 1917 active supporter the Czechoslovak independence movement). In January 1920, after end of Tusar´s mission in Vienna Havlíček followed him to Prague. Under both Tusar´s governments in 1919-1920 he worked in the Presidium of the Ministerial Council. After Tusar´s demission in September 1920 he followed him to diplomacy. Since November 1920 he accompanied him as the legation Councillor at the embassy in Berlin. After Tusar´s dead on 22 March 1924 he led this embassy as chargé d´affaires until 28 March 1925. Then he worked two years in the Central and East European Department of the Political Section of the Ministry of Foreign Affairs in Prague. From 21 October 1927 until 31 October 1931, he became ambassador to Belgium. On 1 May 1932, after a short stage at Ministry of Foreign Affairs, he was appointed to ambassador to Japan, where he fulfilled his mission until 16 March 1939. Two days earlier on 14 March 1939, under Hitler´s pressure, Slovakia declared independence. Next day morning, Nazi Germany occupied rests of two western parts of Czechoslovakia. Thus Czechoslovakia ceased to exist de facto. Slovakia was transformed, after complex two-week negotiations, into a formally independent state, under Germany´s protection. Rests of Bohemia and Moravia were incorporated into the Reich as a Protectorate, with limited internal autonomy, but without any international suzerainty. Administration of foreign affairs of rests of Bohemia and Moravia were overtaken by Germany. In consequence of it, on 16 March the Ministry of Foreign Affairs in Prague was dissolved and at 18.30 all 74 Czechoslovak ambassadors got the telegram from the (at that moment already former) Czechoslovak minister of foreign affairs Dr. František Chvalkovský to give over their offices, buildings and all documents to representatives of German diplomacy in the respective states. However 18 ambassadors did not fulfill that order. Individual states reacted on the new situation differently. Some of them allowed the Czechoslovak diplomats, who declared their disaccord with German occupation and rejected to give over their offices to German diplomats, to continue their activity as representatives of Czechoslovakia. In France and Great Britain and their colonies, to certain degree also in Poland, they could even start to prepare conditions for organizing resistance in exile. On contrary, the allies or satellites of Nazi Germany immediately stopped to recognize Czechoslovakia and forced the Czechoslovak diplomats to liquidate their legations. Somewhat curious was the attitude of Soviet Union. Until closing the pact Ribbentrop-Molotov, the Czechoslovak embassy continued its activity, as Soviet Union protested against German occupation of Czechoslovakia in March 1939. But in August 1939 the Soviet Commissariat of Foreign Affairs asked the ambassador Dr. Zdeněk Fierlinger to leave Soviet Union. However, shortly after the German attack of 22 June 1941, the diplomatic relations were restored, a collaboration treaty was signed and Dr. Fierlinger returned to Moscow on 20 August 1941. Japan, as a German ally, stopped to recognize Czechoslovakia on 16 March 1939 and broke the diplomatic relations. The ambassador Havlíček had to liquidate the embassy and four consulates in Japan. He executed that task, but with a carefully arranged delay, during which he succeeded to save some Czechoslovak ownership against the German confiscation. Then he remained in Japan. As he did not agree with the German occupation, he entered in early 1940 in contact with Czechoslovak resistance centers in France and England offering them information services. Some sources even mention him at that time as a Czechoslovak intelligence officer. Besides it he attempted to act in Japan as a private unofficial representative of Czechoslovakia. However the Japan government accused him from espionage and arrested him in spring 1941 for one year. His next destiny was determined by activities of the USA diplomacy. 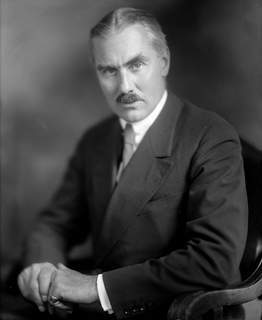 In spite of the fact that the US ambassador to Japan, Joseph Clark Grew (27 May 1880 – 25 August 1965) (Fig. 1) declared, in name of USA, war to Japan on 8 December 1941, after the Japan attack on Pearl Harbor, and he himself was interned for some time, the Americans negotiated with Japan and other states of Axis about mutual repatriation of their diplomat and citizens of other western allies. Thanks to it also F. Havlíček was let free and on 25 June 1942 he was allowed to leave Japan together with other 1450 repatriates, citizens of USA and other Allied countries. They traveled on the Japan liner Asama Maru overtaken by the Japan Imperial Navy, accompanied by the Italian steamer Conte Verde to the neutral port Lourenço Marques in Mozambique, the then colony of Portugal. Reciprocally, 1062 Japan diplomats with the ambassador Kichisaburo Nomura leaved USA with the liner Gripsholm, originally registered in Sweden, chartered by USA, but operating under flag of the International Red Cross. After arriving of all liners to Lourenço Marques, the control and exchange of repatriates was carried out on 22 July 1942. On 27 July the Allies diplomats continued the travel with Gripsholm via Rio de Janeiro to New Jersey. From there Havliček traveled to Great Britain. He arrived to Liverpool of 9 October 1942. His stay in England was registered by the British civil authorities on 12 October. In England he entered in service of the Ministry of Foreign Affairs of the meanwhile recognized Czechoslovak exile government in London. After the war he continued to work at the Ministry of Foreign Affairs in Prague, maintaining the title Ambassador. He also became president of the Commission for Investigation of War Criminals, as well as Councillor for revision of service instructions. After the “Victorious February” of 1948, when the Communist party of Czechoslovakia become the absolute ruler of the country, profound personal changes started in the Ministry of Foreign Affairs in Prague. The experienced between-war personnel, among whom about one half (600 persons) returned in function after liberation, stared to be eliminated from the service. Some officials and diplomats were even accused from collaboration with western states and arrested. A part of them was “only” pensioned, but often with minimum pensions. Dr. Havlíček belonged to the second, “luckier” group, being pensioned already on 31 March 1948, only one month after the political regime change. However, in 1952 he became victim of the s.c. Action B (= akce byty = action flats), during which politically inconvenient persons were expelled from big cities in order to make free good flats for the new elite and its partisans. Information about his next destiny is scarce. Only his obituary notice reveals that he died on 11 February 1958, after a lengthy and heavy illness. The fact that just a single person hist obituary notice indicates that he probably passed his last years in isolation. So far the sad destiny of this notable personality. Remark: Fig. 2-4 (2 x Ships & obituary) are not displayed. 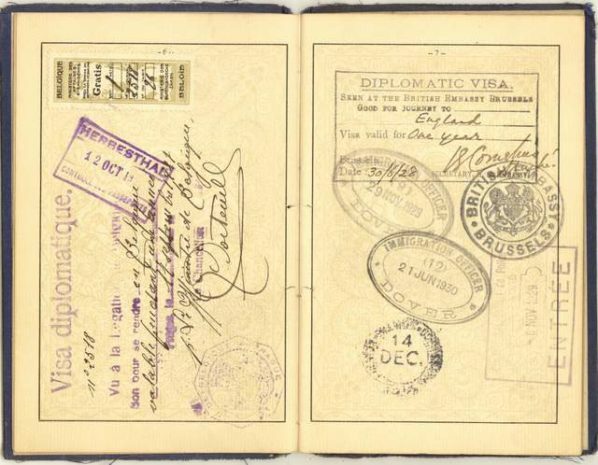 Some of above mentioned important moments from Havlíček´s diplomatic career are reflected by visa and border control stamps in one of his diplomatic passports (Fig. 5-9). He got it on 15 September 1927, shortly after introduction of this type of diplomatic passports. This is also revealed by its relatively low number 391. Similarly as the then usual passports, it was issued with validity of only two years, of course with a possibility to be prolonged before end of its validity or restored after its loss. 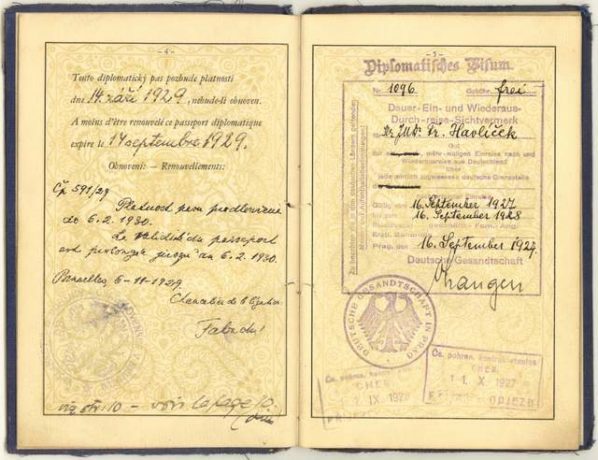 Before the war his passport was prolonged four times, with some time overlaps, until 1930, 1935 1939 and, finely, until 15 November 1943 (Fig. 10), always in a Czechoslovak embassy and signed by a lower official. There is however missing a note about prolongation for the period from 15 November 1943 until 12 November 1945, when it was prolonged (renewed) at the Czechoslovak embassy in London until 31. December 1945 (Fig. 10 and 11). So it seems that Havlíček used other identity document for about two years. 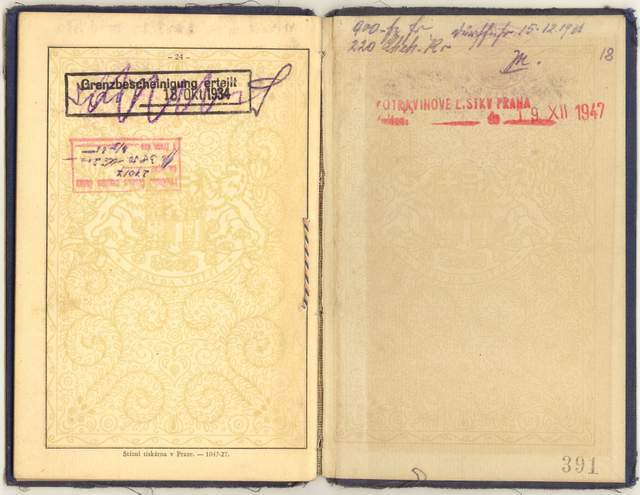 After return to Czechoslovakia, the passport was prolonged for the last time on 28 December 1945 for five years, until 27 December 1950 (Fig. 10). On 11 October 1927 Havlíček left by train through Germany to Belgium, where he arrived next day. Curious is that the Belgian visa is dated to 11 September, four days before issuing the passport. During his mission in Belgium he undertook several travels to England. In 1934 he returned to Czechoslovakia for a short time, but in January 1935 he left through Germany, France, England and USA to Japan. From there he made a journey to France through USA and a trip to Hawaii. The next stamp was imprinted into the passports originates as late as on 27 august 1942 in Lourenço Marques in Mozambique (Fig. 11), when he boarded the liner Grimpsholm to continue his repatriation travel to England, where he arrive on 9 October 1942 (Fig. 11). After the war he returned by plain to Czechoslovakia on 25 November 1945, but on 28 December he left again to England. In late 1947 he returned definitely in Czechoslovakia, as indicated by the stamp confirming receiving rationing cards for food (Fig 12). This is also the last, clearly dated stamp in his passport and, at the same time, the last witness about its use. Theoretically Dr. Havlíček could use his passport still almost three years after his pensioning. But it was not easy. Since 23 February 1948 all holders of valid Czechoslovak passports intending to travel abroad needed an allowance (visa) from the National Security Authorities. In summer 1948 this limitation was temporarily withdrawn, but in 1949 a new Passport Act was adopted. In connection with it all earlier issued and valid Czechoslovak passports of all kinds become invalid since 30 November 1949. Getting a new one, for private purposes was enormously difficult as they could be given just as “exceptions of the new passport act”. This severe practice lasted, as matter of fact, until 1965, when the new Passport Act partly liberalized this agenda. 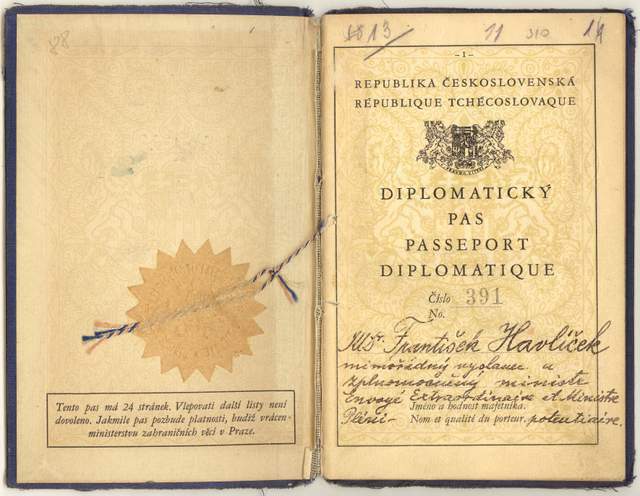 The Havlíček´s diplomatic passport is the only Czechoslovak passport known to the author that was almost continuously valid (prolonged, restored) from 1927 to 1950. 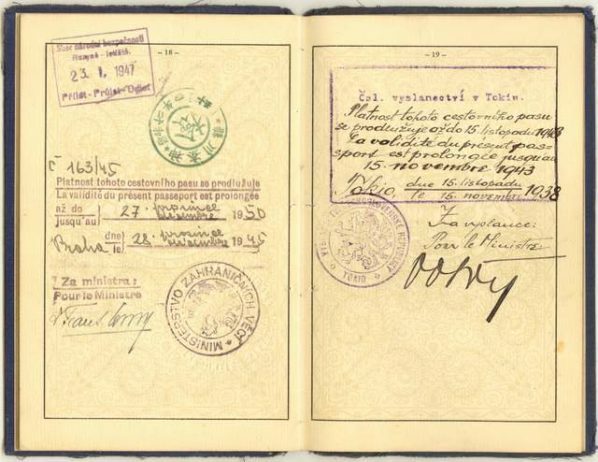 The usual Czechoslovak passports of persons remaining during the war in the country, which were issued or prolonged not later than in 1937, were (theoretically) valid until 1942. The passports issued in 1938 or early 1939 were mostly issued for maximum two years, only rarely for five years, with theoretical validity until 1944. The passports of emigrants in western countries were soon filled by visa and border control stamps and were to be changed for new passports, mostly for the newly printed ones in England in early 1944 or, rarely, for the pre-war types remaining in stock in some embassies until spring 1945. The passport of Slovak citizens issued were issued still in early 1945, with different validity length, reaching sometimes to 1947, but they become invalid via facti, with restoration of Czechoslovakia. 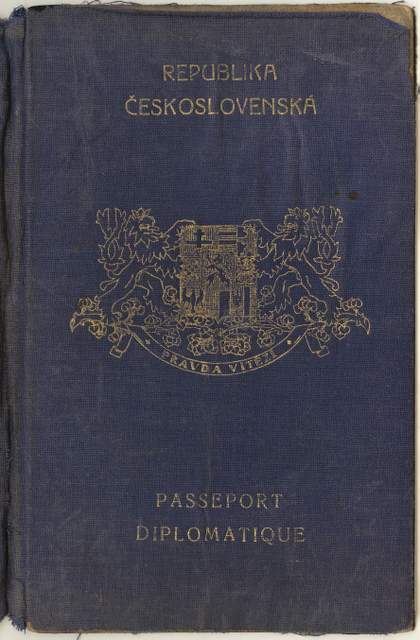 Most holders of the Czechoslovak passports used them before the war usually maximum once a year to a 2-3-week trip to Yugoslavia, often with a short excursion to Venice. But after the war, conditions for private traveling abroad were complicated from both, economic and politic reasons. They could theoretically ask restoring their pre-war passports, but the possibilities to buy legally the foreign money to realize such travels were very limited. In addition, the railway tickets could be sold for Czechoslovak crows only to distance of 250 km from the Czechoslovak borders. Due to it most holders of pre-war passports were neither interested in their restoration. The new passports were issued after the war just for a concrete travel and for several months only. The longer private travels were made only rarely. Due to it chance to find other passport with similar length of validity like the Havlíček´s passport is very low. 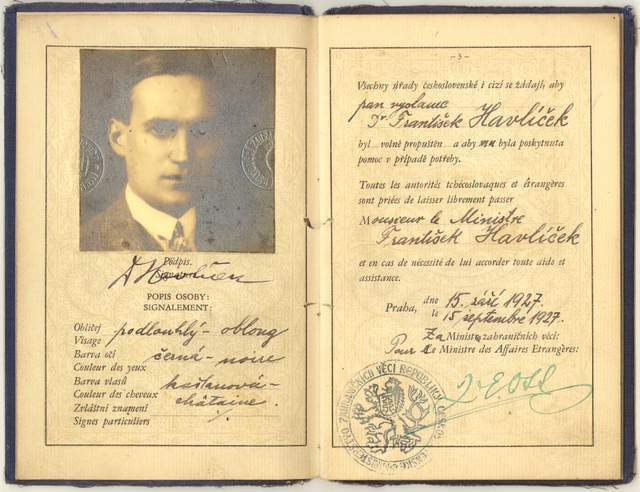 Although Havlíček´s passport does not completely reflect all episodes from his diplomatic career, especially the most adventurous ones from the World War II, it fairly shows how this type of document can illustrate the ways, in which individual persons passed not only the dramatic events of their live, but also the crucial epochs of the world´s history. Fig. 5. The dark blue linen front desk (169 x 109 mm) of the Havlíček´s diplomatic passport, in the centre the great coat of arms of Czechoslovakia consisting of coats of arms of Bohemia (centre), Slovakia (left upper corner), Subcarpathian Russia (right upper corner), former counties of Ratibor and Tešín (centre left and right), Moravia (left lower corner) and Silesia (right lower corner), two lions as the shield holders and bellow with the device PRAVDA VÍTĚZÍ (= The true wins) in Czech language. The passport has 24 sites printed on thick paper (about 100-120 g m-2), without watermark, each site has a yellow folklore stylized vegetation ornament with great coat of arms in centre. All texts are in Czech and French. Fig. 6. Frontispiece with embossed dry seal and title page of the passport.. Fig. 7. Pages 2 and 3 with personal data. Unlike the usual passports the age, birth place, profession and domicile are omitted. Fig. 8. Pages 4 – 5 with data of the passport´s issue, its first prolongation and the German visa from 16 September 1927 for his transit to Belgium. Fig. 9. /ages 6-7 with Belgian visa from 17 September 1927 and British visa for the trips made in 129-1930. Fig, 10. Pages 18 – 19 with prolongation until 15 November 1943 (p. 19. right) and prolongation until 28 December 1950 (p. 18 left). On p. 18 also a Japan border control stapmp is situated and the Czechoslovak stamp given in the Airport Praha Ruzyně on 23 January 1947, after his return from his last travel to England. Fig. 11. 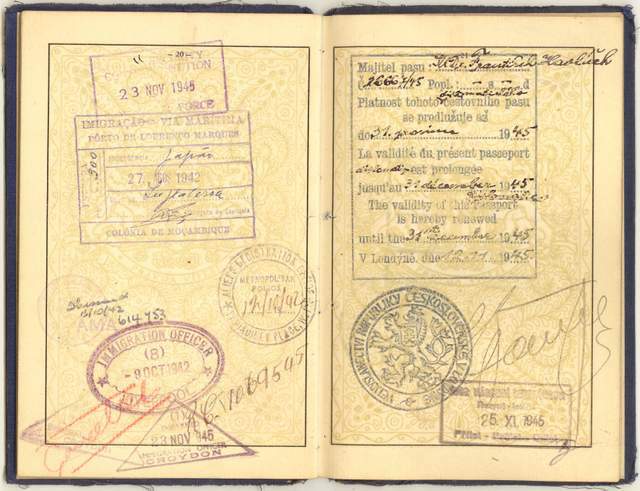 Pages 22-21 with departure stamp from the port Lourenço Marques (p. 20 above), arrival and registration stamps obtained after his arrival to England on 9 October 1942 (p. 20 below) and the penultimate prolongation of the passport to 31 December 1945 made on 12 November 1945 at the embassy in London. Fig. 12. The last stamp in the passport – giving the rationing cards for food in Prague on 19 December 1947.